This tool was designed to forecast reversal pressure, confirming top/bottom and predict price. It’s a proprietary algorithm that takes into consideration abnormalities comparing current & past price speeds and the real kicker is the gigantic weight of time & price levels to the equation. 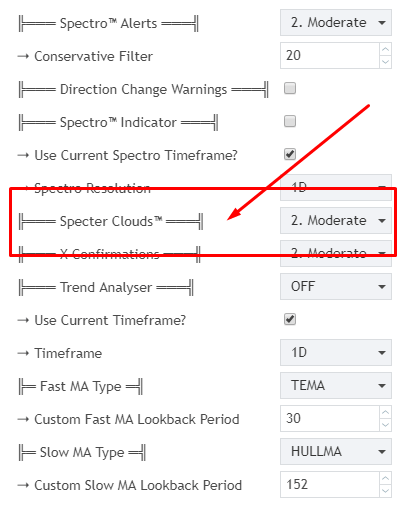 Specter Cloud delivers an easy to read and early warning of possible reversals allowing the trader to prepare several bars before. This mode was adapted especially for bigger accounts – It gives bigger positions the time, edge and volatility they need during accumulation and distribution to achieve a better average entry/exit price. It’s not like we want to be cocky but c’mon, what comes next is pretty cool and a perfect example of usage even on longer time frames, understanding that when the clouds start to appear that means KEY PRICE LEVELS where the action is concentrated. Theory says that price tends to respect those key lines, lines which we call support and resistances. Still using our good volatile friend BTCUSD(D) as an example, in this beautiful textbook +35% in 13 days trade, we will demonstrate how the cloud can be used to predict entry/exit points. The first thing we have to keep in mind is to not yield to our desire to measure trades with the very tops and bottoms. Understand how this would happen in real-time. The cloud starts changing colors somewhere along the open and the close of the candle, so the best way is to pick the average. Keeping it simple, if you’re trading and your cloud starts turning yellow that means the reversal is getting very real. Remember like every other thing in life it’s not 100%, remember to confirm this with the other Spectro M tools & your own strategies. The settings are pretty easy, you can hide the clouds at any time and also you can adjust its triggering conditions to your style.